My most recent crazy idea can be found in a letter to The Libertarian Enterprise. After reading the short description, browse around for a while. You will learn something. 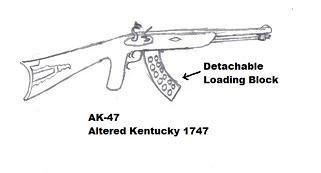 Briefly, my idea is for a flintlock "AK-47". Would it be better to have a REAL, fully functional, AK-47? Of course it would. The psychological value alone is quite high, since few other guns upset the hoplophobes as much. There is no logic to their reaction, of course, but it can be fun to watch. Still, if you live in one of those freedom-destroying cities and don't wish to break even counterfeit "laws", this could be a fun option for you. A way of flipping the authoriturds your "digitus impudicus". I'm sure that the localities which try to forbid toy guns would frown on a flintlock of any kind as well, as the recent incident in Bloomberg's own private prison demonstrates. Find your freedom where you can and, as long as you don't harm the innocent, have fun with it.